…And so begins my Elizabeth Taylor marathon. As I write this post, I skillfully positioned my instant streaming Netflix window in the lower corner of my Macbook as to watch Ms. Taylor in "Cleopatra." Some might say, "no no, start from the beginning," I say to hell with them. I want to start off with something big & epic… and it also happened to pop up first on Netflix. Regardless, RIP Elizabeth T.
It's also nice that such a fancy recipe corresponds to such an opulent movie. 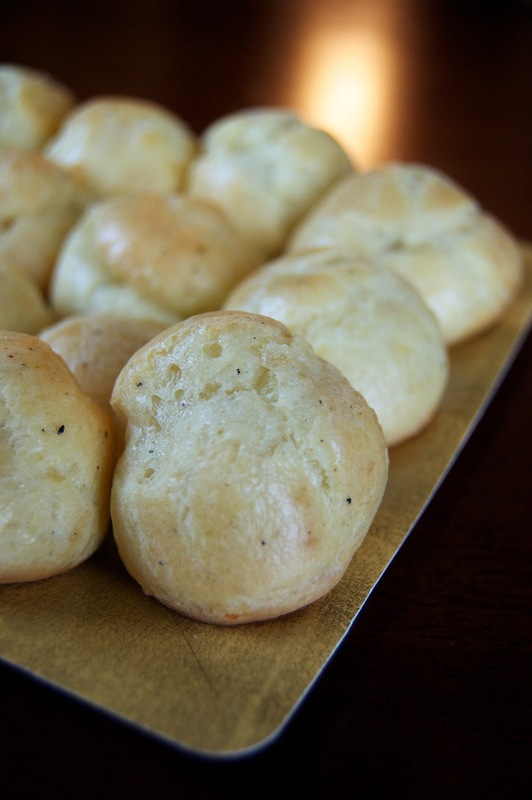 But shhh, I'm going to let you in on a little secret… these cheese puffs, ahem Gougères, aren't hard to make at all. While it certainly helps if you have a piping bag, you can easily use a sturdy ziplock. You say you don't have fancy cheese? Pish posh - I ran to Trader Joe's, stood scared in front of the cheese wall and asked an employee who looked mildly worldly his recommendations. Gruyere? Sounds good. Good Parmesan? Already got some in the fridge. No excuses. Even once I got to the party (yes, this is yet another Superbowl recipe) the comments wouldn't stop flowing in about how they couldn't believe I made from scratch cheese puffs or that they were a nice contrast to the usual Superbowl fare. Even though football season is over (and might continue to be for a year plus), it is officially soccer season (Go Sounders!). Why not make these for your next soccer, erm football (as this IS French food), party? In a medium saucepan, heat milk, butter, salt, pepper and nutmeg over medium heat, until scalded. Add the flour all at once and beat it vigorously with a wooden spoon until mixture comes together. Cook, stirring constantly, over low heat for 2 minutes. The flour will begin to coat the bottom of the pan. Dump the mixture, while hot, into the bowl of a food processor fitted with a steel blade. Immediately add eggs, Gruyere and Parmesan and pulse until the eggs are incorporated and the dough is smooth and thick. Spoon the mixture into a pastry bag fitted with a large plain round tip. Pipe in mounds 1 ¼ inches with and ¾ inch high onto the baking sheets. With a wet finger, lightly press down on the swirl at the top of each puff. Brush the top of each puff lightly with egg wash and sprinkle with a pinch of Gruyere. Bake for 15 minutes or until golden brown outside but still soft inside. These look great. Just curious if you have considered (or tried) using another type of flour, like a pastry or 00 in this recipe? Stacy - no, I haven't (this was the first time I made Gourgeres) and all I had on hand was AP & whole wheat pastry flour... so I went with the AP. Have you had success making them with pastry or 00? I haven't tried this recipe before, however I have been experimenting more with alternate flours and really like the texture they provide. Just thought I'd check w/you before I give it a shot! Thanks. These look delicious! What temperature did you back them at? Yin - oops! You want to bake then at 400 degrees! Thanks!!! I ended up putting them in at 425, because I couldn't resist making them that day and that worked out well also. They were delicious. Thanks so much for your recipes...they're amazing!